The double hit of ginger here comes from both ground ginger and crystallized ginger. Position racks in the upper and lower thirds of the oven and heat the oven to 350°F. Line two large cookie sheets with parchment or nonstick baking liners. In a medium bowl, whisk the flour, ground ginger, baking soda, and salt. In a large bowl, beat the butter and 1 cup of the sugar with an electric mixer (a stand mixer fitted with the paddle attachment, or a hand-held) on medium-high speed until well blended. Add the egg, molasses, and crystallized ginger; beat well. Add the dry ingredients and mix on low speed until well blended. Pour the remaining 1/3 cup sugar into a shallow bowl. Using a 1-Tbs. cookie scoop, a small ice cream scoop, or two tablespoons, shape the dough into 1-inch balls. Roll each ball in the sugar to coat. Set the balls 1-1/2 to 2 inches apart on the prepared cookie sheets. Bake, rotating the sheets halfway through baking, until the cookies are puffed and the bottoms are lightly browned, 12 to 14 min. If you touch a cookie, it should feel dry on the surface but soft inside. The surface cracks will look a bit wet. Let the cookies sit on the cookie sheet for 5 min. and then transfer them to a rack to cool completely. When cool, store in airtight containers. 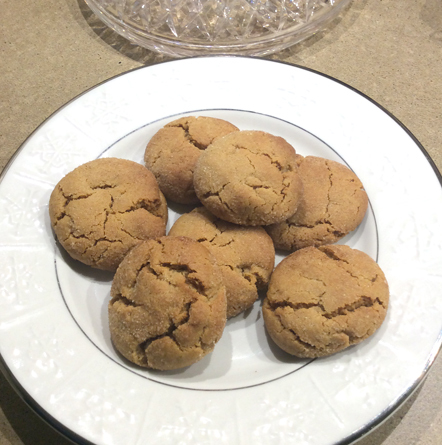 Ginger flavor intensifies with time, making these cookies excellent candidates for long keeping. When stored in an airtight container, the cookies remain impressively delicious for up to five days from baking. Well wrapped, the cookies will keep for several weeks in the freezer. tool for every site admin (for content creation and SEO).